Well, I’ve just about recovered from Surrey Art Fair which was great fun with good sales but boy…….exhausting! Loved being in a little ‘enclave’ with painting pals. We did a lot of giggling and sharing of all things chocolate and were able to watch each others’ stands when the obligatory wee was required. I stayed in a sweet little airbnb up the road which I had to myself so at close of day didn’t need to speak………not that I could! Anyway, onwards and upwards. I’ve just been out to buy painting subjects for the weekend from the wholesaler so that’s me – holed-up for the next two days whilst you all enjoy some R&R. Not sure I thought it through properly so I’ve got a job on my hands to paint them before they die. Still, Jobbers is away so the house is empty bar me so I can make a rare old mess in the kitchen prepping panels and eating when I like. Bliss. So, before I hit you with my flower bomb, here’s some good old garlic – always a great subject, panders to my obsession with whites and doesn’t wilt. Have a lovely weekend. I’ve been a little bit captivated of late by Monty Don in Japan. I’d love to see the cherry blossom but having to make do with a gorgeous tree in our village which heralds the very beginnings of spring each year. The owners kindly let me pinch a bit so I did this little oil sketch and then worked on a larger one for Surrey Contemporary Art Fair which is next weekend (let me know if you’d like a complimentary ticket). Morning! I’m told that today is the last of the warm sunshine for a while but it’s given us a little taster of what’s to come. 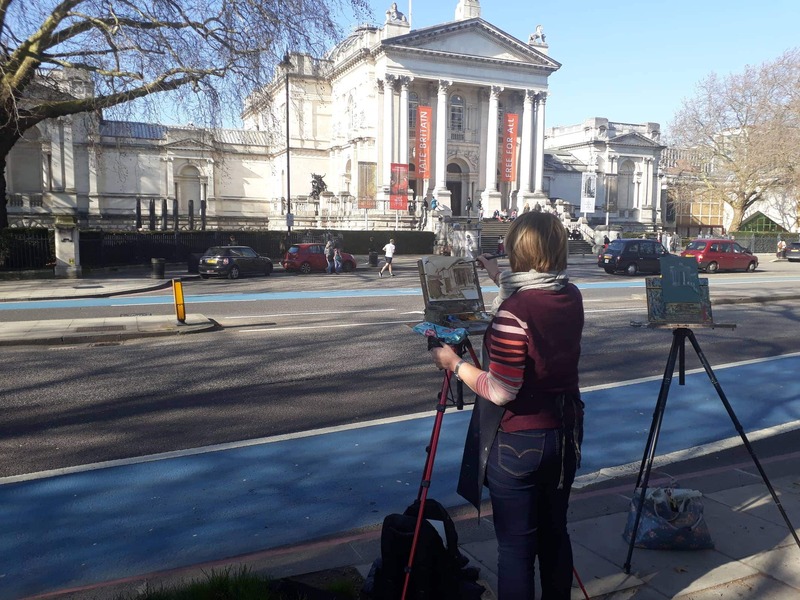 I had a great day painting in the sun in London on Sunday and look forward to a few more trips soon. I’ll be heading off to France in April with some painting buddies and hope to get lots done and chew the cud over some moules frites! In the meantime, here’s a little springtime cheer for you. Oh this glorious sunshine is doing the soul some good! The snowdrops in my garden a fairly twinkling. I couldn’t resist doing another one. Bubba has been out sunbathing in the garden for the first time this year. It must have been exhausting as he’s sparko in his basket now. It’s a dog’s life. Incidentally, I’m painting up a storm ready for the Surrey Contemporary Art Fair on March 15th-17th where I’ll be standing waiting for you in my best bib and tucker (well……..I’ll do my best). I have free tickets if you’d like them. It’s that time of year. Everything coming thick and fast and me in a rare old panic. Love Snowdrops though don’t you? Waiting for the warmer weather tomorrow………what a treat! Albeit a little late . . . .
After a long sojourn across the pond with family for the festivities, it’s good to be back in the saddle. Pop the kettle on and put your feet up and let’s have a catch up. It was great fun in the US where I spent most of the time chasing my gorgeous granddaughter Freya round in circles – her favourite game! At 2 1/2 she’s a ball of energy. At considerably older – I’m not! Since being back I’ve been working on my new website. Hope you like it! https://pennygerman.com/ but let me know if you spot anything iffy. One of my (many!) NY resolutions (apart from t he obvious weight-loss, teetotaling nonsense which generally lasts no more than a week) is to do more small oil sketches, so you should be hearing from me more often with some paintings to peruse. I’ve missed these little fellas but was caught up with gallery and exhibition work all of last year. 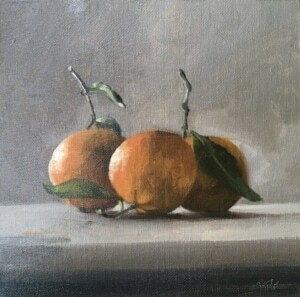 I still am but am resolved to get some more small oil sketches done as they are a great discipline and keep me connected to you all. I also miss the cyclical nature of seasonal subject matter so will be following mother nature through the year as she definitely feeds into my creativity. It’s important for me to always paint with passion and doing ‘dailies’ was beginning to feel like a chore……..just getting one done to blog or a commission. ’Authenticity’ is a bit of a buzzword among artists at the moment and I’m on it! It’s the most important route to producing good work, staying true to oneself and constantly evolving. So, I intend to paint small ones when and where I can and offer these up via my blog along with plein-air work and, since many of you paint, my working process. I’ll also have offers from the studio. Thought that might grab your attention :). Sometimes, I need a clear-out in the studio so I shall be offering you the chance to buy larger works at a much-reduced price. 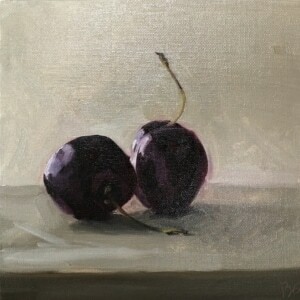 In the meantime, the small oil sketches will have to see an increase, more in line with what I sell for elsewhere. I hope you will understand that I have to eat! There are so many huge costs and outlays in an art business, people often look at the finished painting price and don’t realise the hidden costs involved they just imagine it’s time alone and a few bob on materials. Hmmm. If you’re interested in workshops, I’m pleased to say I’ll be holding a three-day (optional days) still life boot-camp! This will take place from 1st to 3rd April at Yardley Arts Centre, in Northamptonshire. It’s a fabulous venue and my course is designed to introduce you to oils. If you’re already familiar with oils don’t worry you can just do the second and third day if you prefer but it will really be a good grounding. Hop on over to the link above and see the details. https://pennygerman.com/wp-content/uploads/2019/03/Heading-in-Blue-ARBSA.png 0 0 Penny German https://pennygerman.com/wp-content/uploads/2019/03/Heading-in-Blue-ARBSA.png Penny German2019-01-15 09:26:292019-01-15 10:55:44Happy New Year!